Yesterday I attended the memorial service for the mother of one of my friends. She lost her fight with cancer and the Lord took her home. She was an amazing woman of incredible faith and prayer. At the service we sang the song Amazing Grace. It’s a simple song that most of us know, but it’s worth taking another look at the lyrics. Before I went to the service Alycia and I had been talking about grace. As I’ve gotten older and more mature, I’ve realized that I need so much grace every day. Dallas Willard helped me see that grace isn’t a one-time thing that we need when we come to Christ. We need grace every day, it is grace that enables us to live like Christ and spread God’s kingdom. Yesterday we celebrated and remembered a life lived with grace. Amazing grace is what allows us to live an amazing life, one that is surrendered to Christ and his desires. 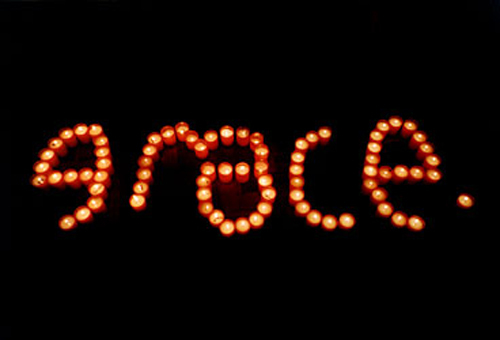 Grace also brings us through our most difficult trials and makes our celebrations that much sweeter, when we realize we’d have nothing to celebrate if it weren’t for grace. Grace is amazing and we need it every day. How do you depend on grace?